For the last fifteen or so years, I have been getting a lot of pleasure from listening to my Neptune DIY three-way speakers: first in their original semi-active configuration, then even more so once I finished designing and tweaking a passive crossover for them. They have a big, easy-going sound which is never fatiguing, and with much of the music I listen to can be very enjoyable, especially driven by my push-pull 300B amplifier. Piano music and acoustic jazz in particular sound pleasantly natural, warm and inviting. I am also pleased with the look of the cabinets, which I made from 18mm MDF with a nice cherry veneer, and they have worn very well. I did start to feel in the long term, though, that the lower bass was slightly boomy, and upper bass a little weak. Some of this was certainly from the less-than-ideal listening room, but I think the bass enclosure might have been bigger than it needed to be for the target BW3 alignement. 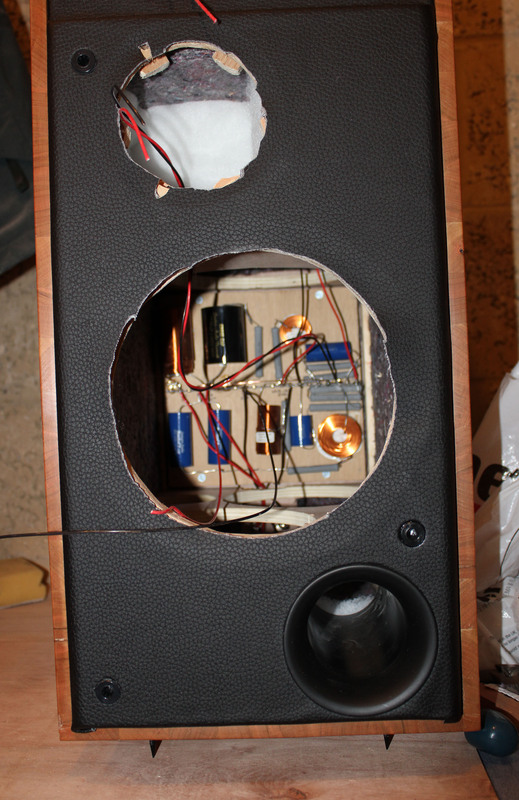 Over the years, I have had a few ideas for minor improvements to the speakers. In particular, I had some thoughts about rebuilding the crossover with a more spacious layout, and replacing the coils with air-cored parts. It did occur to me (after I had bought most of the parts for the present project!) that if I cut the bottom 20cm or so off the bottom of the box I could ameliorate the excessive bass, at the same time as putting the tweeter axis closer to the listening height, as well as making the speakers less physically imposing (and concidentally look even more similar to the Wilson Watt/Puppy). To do this neatly, though, would make heavy demands on my woodworking skills and tools, and would also require me to shorten the grilles for the lower boxes to fit. In the end I decided that further tweaks would still not address all the basic limitations I listed above, and started thinking about building myself a new pair of speakers. 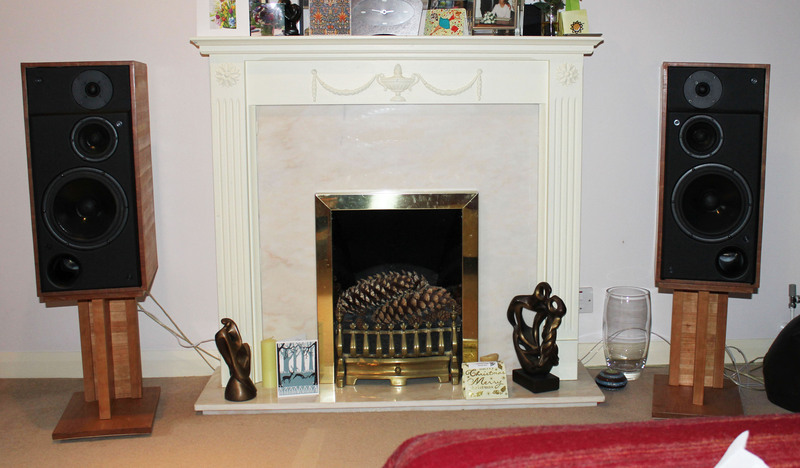 and, finally, domestic acceptability: the speakers need to look at home in our modern but relaxed living room. "I don't think you can do any better than Troels's designs. If Troels were working commercially he would probably be regarded as one of the top speaker designers." "His design tends to be very balanced and the sound has an even-handed characteristic and good for long term listening. ... all of his speakers are very carefully designed. After listening to his speakers for a while, there is something right about the way they sound." "I have heard a few of Troels' creations and overall I really like the general signature/sound they present." "I haven't heard them, but from what I see on his website, he knows his stuff, and has good taste in drivers and system integration (which is very rare in the commercial high-end). He auditions the system and does a lot of fine-tuning - measurements do not tell the whole story with any loudspeaker, and you need to do more than a bit of twiddling to the design to make it sound its best. "His subjective descriptions of what drivers sound like is right on-the-money; that's the voice of experience - again, all too rare in the commercial high-end, which is aiming for some bizarre sound that the mainstream reviewers like". Troels' particular strength, I think, is in designing crossovers to give near-perfect blending between drivers, while neatly compensating for non-ideal frequency responses of the drivers. He also manages to get almost the same overall gentle downward tilt of two or three dB from low to high frequencies in almost every one of his designs: these measurements are made in the near-field, so in a normal listening environment the tilt will be balanced at least partly by the baffle step loss. As an illustration of how popular his designs are, look at his builders' responses page! To start with I was drawn to his NOMEX 164 two-and-a-half-way speakers, which have a rather attractive and elegantly slim cabinet, and I e-mailed Troels for his advice. For reasons I can well understand, he is reluctant to make any specific recommendations for his projects, but he thought that my amplifier would prefer a more efficient design with a higher impedance, specifically mentioning his SEAS 3-Way Classic mkII and his quarter-wave pipe designs. I liked what I read about the latter ultra-efficient TQWT and DTQWT, but these are imposingly large boxes, and the Classic mkII was the only one of his projects with sensitivity over 90 dB/1m/1W and an eight-ohm impedance that was modest enough in size for the intended location. The fact that it uses relatively inexpensive drivers and a fairly simple cabinet construction was a bonus. I did consider the very similar 3-Way Classic with Scan-Speak Discovery drivers, since Troels seems particularly pleased with the midrange performance of this design, but settled on the SEAS alternative mainly because of its 2-3dB sensitivity advantage. Since I started work on my own project, Troels has published the much more ambitious and costly Audio Technology 3-Way Classic with a similar cabinet and baffle layout, but using Audio Technology bass and mid drivers and the ScanSpeak R3004/6020 tweeters. This offers much extended dynamic headroom in the bass and a more sophisticated midrange driver with the potential (he says) for a much more detailed delivery, but the cost of these drivers alone would have put me off even if I hadn't already committed myself to the SEAS project. 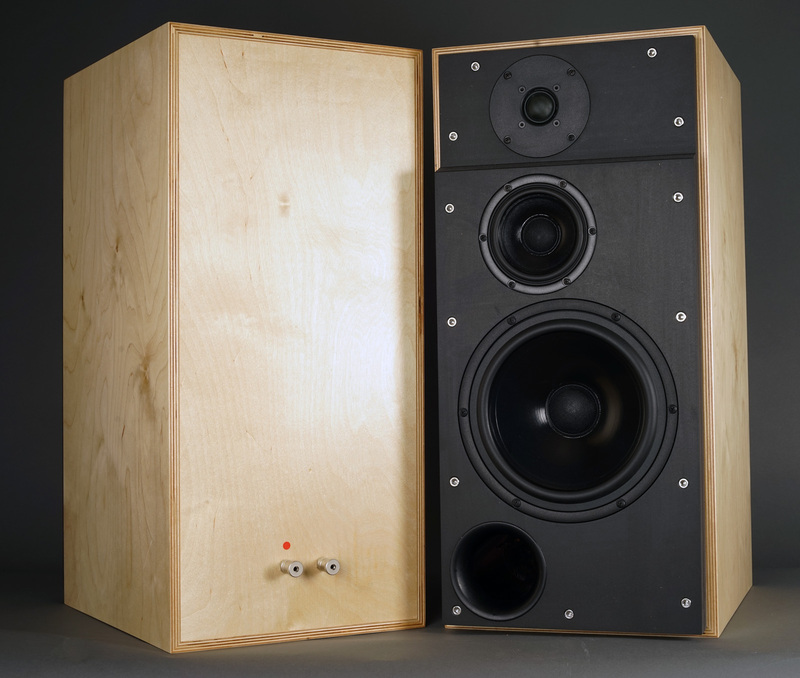 This is one of a quartet of Troels's designs in what he calls a "classic" configuration: namely a three-way speaker in a medium-sized stand-mounted rectangular box. Troels cites the SEAS kit speakers as inspiration, but the Classic is also reminiscent of the legendary BBC-inspired speakers of the 1970s such as the BBC LS3/6 and the Spendor BC-1s, as well as the Celestion Ditton 33. 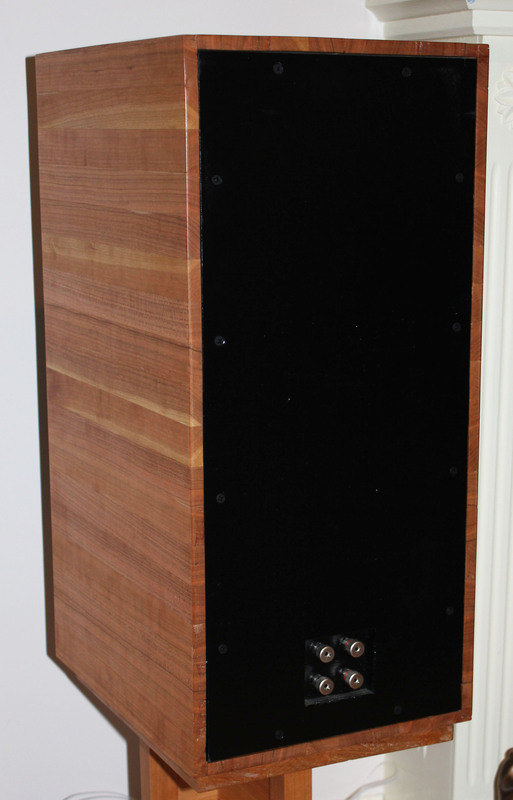 This style of speaker is still popular, recent examples being the Spendor Classic range and the Harbeth Monitor 40.2. This tradition has tended to concentrate on an uncoloured midrange, with the BBC designs optimised to give the most realistic reproduction of the human voice, even though the first generation or two were considered - particularly among the "flat-earth" commmunity - as being not so well suited for rock music. I suppose the "classic monitor" approach would also include ATC's mainstream range (ATC themselves denote this the "Classic" range! ), particularly the SCM50, their smallest three-way model. Three-way designs are generally reckoned to bring a "rightness", to the sound, mainly, I would guess, because the wider dispersion of the smaller midrange driver, relative to a two-way with a 6-8 inch midwoofer, gives a more uniform off-axis response. Like the SEAS kits speakers, but unlike many of the "BBC" models such as the SP1 and the LS3/6, the Classics are true three-ways, with a four-inch midrange driver covering the range between 700Hz or so and about 3kHz, where in the BBC designs the eight-inch woofer covers the whole midrange as well, crossing over to the tweeter at 2-3kHz, while the latter is augmented by a super-tweeter above 13kHz. This will have implications for the off-axis response, which will suffer from a large amount of "beaming" at the top of the passband of the mid-woofer, in contrast to the more controlled directivity of Troels's designs. The only potential advantage of the BBC approach that I can think of is that the whole range of voice fundamentals is covered by the same driver, without the crossover messing up the phase. Troels's original in this line was the 3-Way Classic, and the Mk II replaces the flat front baffle of the Mk I with a stepped baffle, aligning the acoustic centres of the mid and high frequency drivers in the same vertical plane, and this allows a simpler (true second order) crossover. The Mk II again uses exclusively SEAS drivers: the CA22RNY 8-inch woofer, the MCA12RC midrange, and the 27TFFC tweeter (the latter, incidentally, almost identical to the 25TFFC in my more than 20-year-old ProAc Studio One Mk. IIs, but without the notorious 3dB or so rise above 10kHz of the latter). The only part of the design that makes me at all uncomfortable is the fact that using a second order crossover demands that the midrange be wired with opposite polarity to the other drivers. I fully understand why this is the case (180-degree phase rotation at a second-order filter), and also that any system covering nine octaves must be compromised in some aspects. Using a fourth-order filter like the ones in my Neptunes allows all three drivers to be connected in phase, but at the cost of a larger (360-degree) phase rotation around the crossover points themselves. The trade-off is between a larger phase shift that occurs over a small frequency range, and a smaller phase shift plus polarity inversion over three octaves or so: my inclination these days is towards the latter. Given the size, this is a speaker that might please a lot of people and annoy few - if any! Smooth is what is - and efficient too. With a healthy 90-91 dB sensitivity it's 1-1Â½ dB more sensitive compared to the mkI - and an easy load for even fairly low wattage tube amps. I recommend minimum 15-20 watts to get some of the dynamics. The transition from bass to middriver is slightly improved from the mkI version in rendering a closer LR2 topology and with the stepped baffle allowing true LR2 topology for the mid/tweeter, the driver integration is as good as can be and significantly better than the mkI version. I simply do not notice where one stops and the other takes over unless I beef up tweeter level by e.g. shorting R1011. The slight snappiness/aggressiveness of the mkI's 2nd/3rd order mid/tweeter crossover is gone, which is a trademark of all speakers using this topology. I render this speaker a significant improvement over the mkI version. So this speaker seemed to match up to my requirements very well. 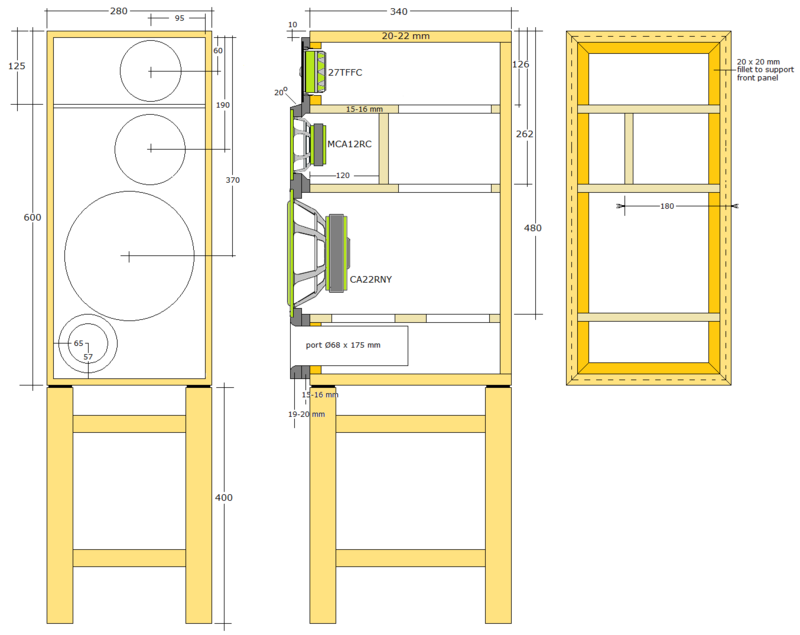 Troels provides clear and detailed plans for building the cabinet of the 3-Way Classic, along with copious construction photographs (actually there are more photos in the article on his Scan-Speak 3-Way Classic, but the two speakers are identical inside, apart from the height of the middle shelf brace). He insists that the baffle be dimensioned exactly as in his build, as otherwise the frequency response will differ from his. I indeed followed his dimensions almost to the millimetre, but made some minor modifications to the construction - partly to make the best of my more modest toolset, but partly, of course, to put my own personal aesthetic touch to the final result. Unlike the "BBC" designs like the LS3/5A, LS3/6 and BC-1, which have the traditional thin-walled plywood enclosures, Troels's designs are built solidly with cabinet walls a couple of centimetres thick. He uses Baltic birch plywood of around 20mm thickness for the main part of the box, and a sandwich of two layers of through-coloured black MDF for the stepped front baffle. The midrange is mounted in its own modest enclosure, while the woofer is loaded by the remainder of the internal volume, which is broken up by the central midrange sub-enclosure, as well as the three horizontal braces, so discouraging standing waves along the vertical axis. As Troels points out, the midrange compartment needs to be completely sealed to avoid interactions with the backwave from the bass driver. 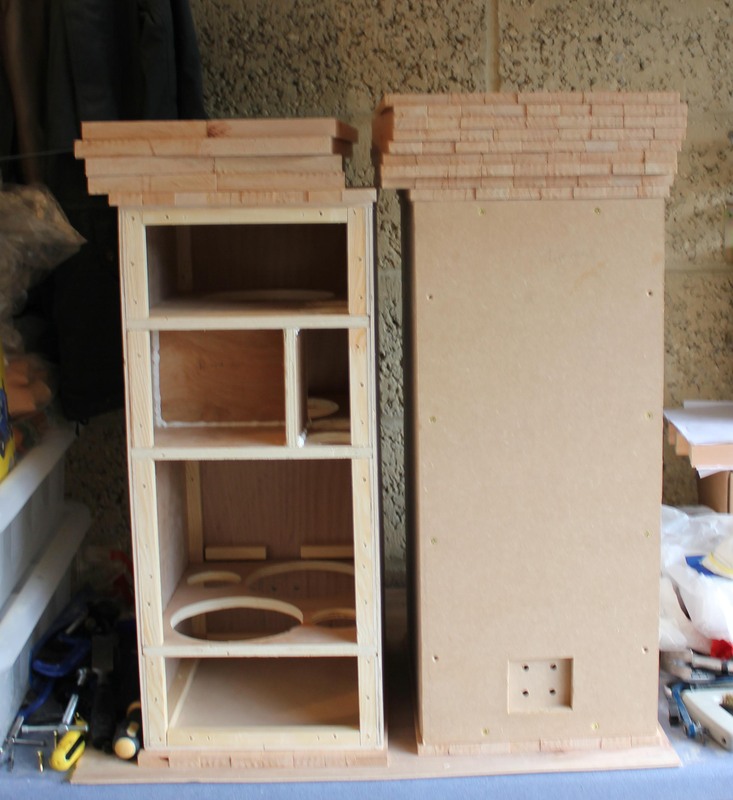 My speakers were built with an inner shell made up of two layers of 3.5mm plywood (see left), with the inner plywood layer cut to make mortices for the interior braces for extra rigidity and convenience during assembly. 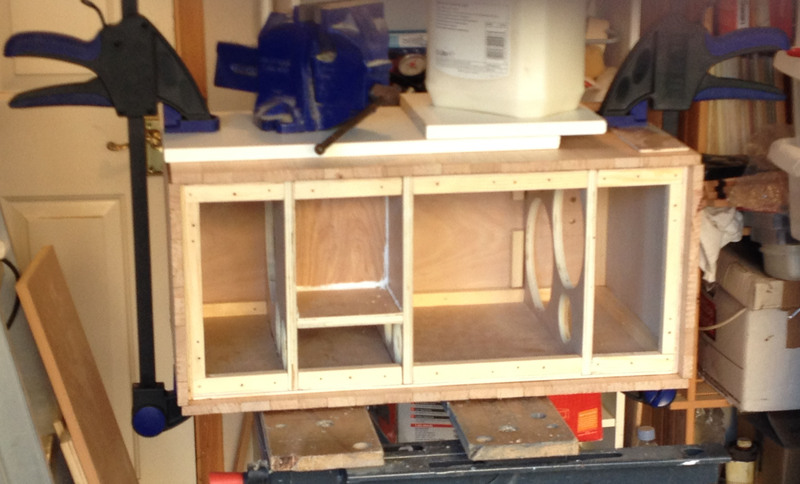 There is an outer hardwood layer, framing the rear panel and the inner front baffle, with only the lower portion of the baffle, with the mid and bass drivers and port on it, extending out of it. I decided on cherry, partly to match our existing decor, but also because it is hard enough to be durable, at the same time as not being too hard to work with. I chiselled out a further groove in one side panel of each speaker for the end of the rear part of the midrange enclosure, partly again for ease of location, and partly to improve the air seal of this little chamber. The outer panel of the baffle needs to be 18-20mm thick to get the correct time alignment of tweeter and midrange, and Troels specifies a rather precise 20 degree bevel for the step between tweeter and mid: this relatively steep angle allows the midrange and tweeter to be close together on the baffle, but also avoids reflecting too much of the "side wave" from the tweeter either at the listener or directly up to the ceiling. I don't own a router, and therefore was unable to make rebates for the drivers in the way Troels does, so I tackled the baffle in the same way as I did for my original Neptune speakers. This involved making up the baffle from layers of wood of various thicknesses to allow me to saw a circular cutout of the appropriate diameter in each layer. I used a layer of 6mm MDF and one of 12mm MDF for the outer piece, and a layer each of 3.5mm plywood and 12mm ply for the inner, full-length baffle. Pleasingly, the outer baffle ended up 19mm thick, right in the middle of Troels's recommended range. I used a hand plane to make the 20-degree bevel on the now laminated outer board of the baffle and, once the baffle was trimmed to the exact dimensions to fit the rest of the carcass, did the same around the bottom edge for the sake of visual symmetry. The 6mm outer layer was the correct thickness for the large bass driver, but a little too thick for the midrange, so I made an extra gasket from 1mm plywood so its front was flush with the baffle too. For the most part, I used a good old-fashioned carpenter's saw to cut out the panels. I own various electric saws, but I find that I can make clean straight cuts to within better than a millimetre with the hand saw, providing the workpiece is firmly clamped down, and it is a lot quieter (and much less messy) than anything with an electric motor in it. I did use a jigsaw to cut out the driver holes and the holes in the shelf braces, tidying up the edges with a half-round file before the final sanding. Troels is insistent that the hole in the baffle behind the midrange driver is chamfered at an angle of around 45 degrees to allow clear space for the backwave immediately behind the cone. This made sense to me (indeed, I did the same thing with my Neptunes) and I did the bulk of this with a 25mm wood chisel and then a half-round file to smooth out the chisel strokes. The result was a bit rough compared with Troels's router work, but job done. The only drawback with the chamfering is that it didn't leave much purchase for the midrange mounting screws, and would certainly have ruled out using T-nuts. I inserted small pieces of chipboard around each screw hole to extend the depth for the T-nuts to bite into, which worked well, if rather untidily. The port tubes, as suppled by Jantzen, were 220mm long, where the plans for the Three-Way Classic specify a 175mm length port, so I cut them down to size before gluing them into the holes on the baffles. After the ports were fixed into place, I filled the gap between them and the inner baffle with silicone sealant to help damp vibrations in the material of the tubes. Troels glued his back panel and screwed the front one. I spent quite a while considering how to make the front of the speakers attractive (see below), and I didn't want to mar the baffle with visible bolt heads, so the baffle was fixed from behind with screws. Fixing the back panel with screws, on the other hand, makes for easy access to the crossover board. I recessed the binding posts into the rear panel, again using layers of different thicknesses of board (in this case, three layers) to give a neater finish. This was primarily to make the rear aspect look neater, but it also makes it easier to lie the boxes on their backs if necessary. The recess is in the outer layer of 12mm MDF, with the binding posts fixed in holes in the inner layers (of 6mm MDF and 3.5mm plywood). I chiselled out a small gap in the rear of the lower horizontal brace, so that I could avoid routing the wires between terminals and crossover through the large hole in the shelf - otherwise I would have had to unsolder the wires to take the back off. Finally I painted the back panels a smart but unobtrusive satin black, and fixed them into place with twelve 4mm black drywall screws per speaker. Troels recommends 40cm high stands, which bring the tweeter to a height of about 95cm above the floor. This presented a new challenge for me, as the Classics were the first standmount speakers I have built, and I spent quite a while working out the best way to put these together. 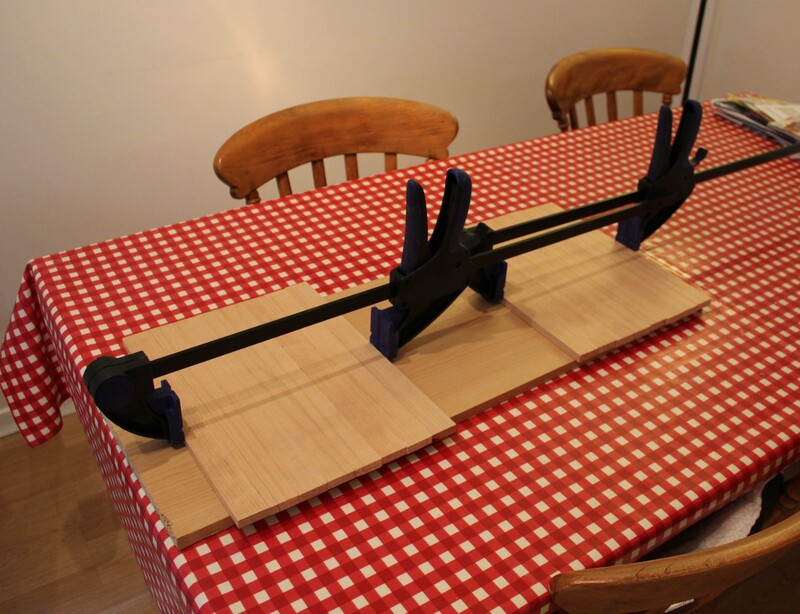 I started off with a fairly simple construction in mind, with 18mm solid cherry upper and lower platforms and three 35cm, 3cm square uprights for each stand. It seems that the maximum plank width for standard American Cherry is somewhere in the range of 200-220mm before the timber starts to contain sapwood, so I had to make up the horizontal parts from two halves to get the full width of 260mm. As the project developed, however, I realised that the speakers were turning out to be rather too heavy for just the three legs under them, and started to get visions of the whole thing collapsing under its own weight. After a lot of hard thinking, I suddenly had the inspiration to fill in the gaps between the legs with the offcuts from the cladding, neatly matching the stands and speakers, and at the same time reinforcing the structure. I installed a set of four threaded 6mm bushes in the base of each speaker, and loosely screwed a 30mm bolt into each of them through holes in the top of the stand. A couple of weeks after I glued the two layers of the base together I noticed that they had developed a slight bow upwards in the middle: either the cherry had expanded, or the plywood had shrunk. Anyway, this warping seemed in the right direction to support the weight of the speakers though the four spikes, so I didn't get too worried about it, and it isn't too noticeable. Troels's crossover for the Classics is a straightforward three-way second-order filter with transitions at around 700 Hz and 2.8 kHz, albeit with some tweaking to compensate for minor departures from ideal behaviour in the drivers, alongside some impedance correction for the inductance of the woofer and midranges. He hasn't attempted to compensate the impedance peaks of these two drivers, as can be seen in the impedance plot on his page. I spent months doing this for my Neptunes, and in the end managed some satisfyingly flat traces, which certainly removed at least some of the boominess in the deep bass, and helped the crossovers to work as intended. The crossover kit is available from Jantzen in Denmark: in fact, as with several of Troels's other projects, some of the component values are only made available with the kits. I guess that this lets Troels get at least some remuneration for the enormous outlay of time he has contributed, and helps keep counterfeiters at bay. I settled on the Standard kit, at least for the moment: the Superior kits include upgraded capacitors, but since I generally use fairly run-of-the-mill parts (well, Mundorf KP-SN capacitors, actually) in my electronics, I considered the Jantzen Standard caps perfectly adequate, at least at the initial stage of the project. I may well be tempted to try an upgrade in due course to the Jantzen Superior caps, which have a higher voltage rating, and which Troels claims sound better than the standard range. The kits are actually pretty good value for money, given that they include very nearly everything that goes inside the boxes, including the crossover components, wire, binding posts, tag strips and acoustic damping material. I ordered an extra pair of binding posts with my kit, so that I could bi-wire the speakers. There are physical arguments as to why biwiring might make at least a slight difference, even if I am not convinced I have heard one, but it is nice to provide the option for bi-wiring - or indeed for passive bi-amping, which really did improve my ProAcs when I used two stereo Croft 5 amplifiers driving them. Besides, my 300B amps have doubled-up binding posts at their outputs, so I thought I might as well replicate this on the speakers. I put the crossover together very much as in Troels's photos: I stapled and epoxied the supplied tag strip onto a piece of 6mm plywood, soldered up all the parts, glued the capacitors and coils to the board and finally screwed the assembled board to the back panel behind the bass driver. The kit supplied choices of 2.2 ohms and 2.7 ohms for the tweeter attenuation resistor R1011 (although the parts list supplied by Jantzen specifies 1.5 ohms as an alternative). Troels says "With R1011=1.5 ohm we have fairly flat response. My default is 2R7 making a better balance of mids and highs". Once everything was ready to fit together I glued sound damping sheets (dubiously named "Expert Roadkill") to interior panels, screwed the crossover in place, made the soldered connections, fixed the 8mm grey felt included in the crossover kit around the interior faces, and then put the Acoustilux wadding into place. In the end I bought the drivers from Falcon Acoustics in the UK instead of from Jantzen as (to my surprise, given the price hike UK sellers often impose) the prices worked out lower, even before including carriage costs. I decided on a less sharp outline for the cabinets than either Troels's boxes or my Neptunes: the domestic consensus was that the former were a little too "square" for our liking, and I personally don't find the "studio", ATC-style front aspect of Troels's prototype, with its prominent fixing bolts and projecting baffle, very attractive in a domestic environmen. After much thought I settled on a finish to match our living room furniture, using 34mm strips of 12mm planed cherry wood for the top, bottom and sides. Once the plywood and MDF carcass was complete, I glued the cherry slats into panels, eight each for the top and bottom, and eighteen for each side (see photo on the right), then fixed them around the box, again with PVA adhesive. Bamptons Timber did a nice neat job of cutting and sanding the pieces for the shell and stands, so making up panels was gratifyingly easy work. Once the last bit of glue was set, I planed the ends at the front and back flat. I bought an electric planer (a Black and Decker KW750K) especially for this part of the project, and found it a great help - my usual hand plane was simply not up to the job with the hard and dense cherry wood, and the power tool left a really nice smooth finish, though it demanded a lot of care in use. Finally I sanded the whole thing with 120 and then 400 grade paper, gave it three coats of Watco Danish Oil, sanding in between coats, and finally rubbed it over with wax. 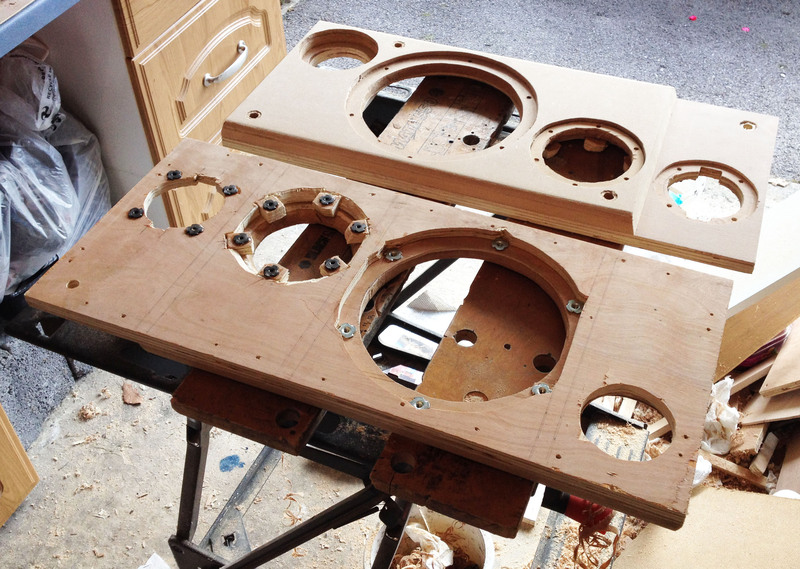 This turned out to be a surprisingly straightforward way to finish the speakers: although sourcing the timber was quite expensive, I found it much easier - and definitely a lot less messy - than using veneer, as I did in the Neptunes. The only really tedious task was cutting the one- and two-metre lengths of cherry as supplied into 104 slats, each of about 362mm length: this is one part of the job where I was really tempted to use a power saw, but - as with the rest of the project - I had much more faith in my ability to cut cleanly with a handsaw. The disadvantage of my layered construction of the baffle is that I couldn't produce the clean lines and angles that Troels does from his solid black MDF, so I needed to add a certain something to finish off the front of the speaker. 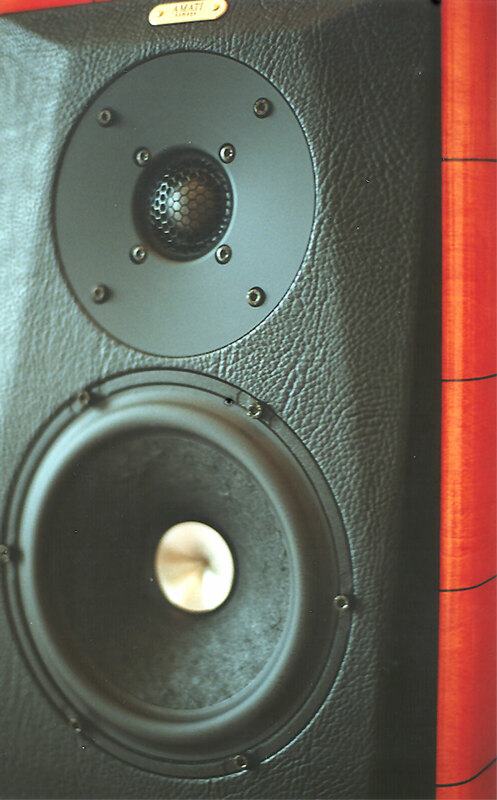 A few years ago, I went some way down the road of planning a clone of the original Sonus Faber Amati Homage, after having been struck by both the sound and the looks of this landmark speaker at the 1998 Heathrow Hi-Fi Show. This went nowhere, partly because of the cost of the drivers, and partly because I didn't feel ready to replace my Neptunes at that stage. All the same, I have had a fantasy in the back of my mind ever since about trying to replicate the superb finish of these speakers; in particular, I really liked the look of the front of the Amatis, with the striking contrast between the soft black leather finish on the baffle and the curved contours of the glossy hardwood side panels. As it happens, more than a couple of builders of Troels's projects have used Sonus Faber speakers as a model: here is a rather gorgeous Polish build of the Ellam XT inspired by the Sonus Faber Guarneri, while this one, by a builder in Sweden of Troels's Ekta, looks impressively like the Amati itself, as does this realisation of the Ekta Grande. It occurred to me that I could incorporate this style at least partly into my 3-Way Classics, thereby solving the puzzle of how to finish the baffle. Once I had finished off the cherry cladding, I covered the baffle with textured recyled black leather, wrapping it around the sides of the inner baffle as well to hide the edges, and attached it to the MDF baffle with PVA adhesive and staples. This didn't turn out to be as straightforward an operation as I had hoped, since the leather wasn't quite stretchy enough to fit over the corners of the outer baffle without any wrinkles. The result, all the same, is quite acceptable, particularly with the drivers and ports secured into place. At the start of the project I intended to create a rounded contour all round the front and back of the boxes with radius of a centimetre or so, but by that point I was feeling a little scared of my electric planer: it had a tendency to gouge out more material than I wanted, particularly at the start or end of the stroke, and even more likely when I was getting tired. I balanced the likelihood of my ruining my project in a moment's carelessness against the slight advantage of rounded edges on the diffraction from the baffle, and decided to play it safe. Besides, Brenda told me she thought the squared edges quite attractive. With a resident cat and the regular presence of two very active young grandchildren in the house, some way of being able to hide the otherwise exposed drivers out of the way of temptation was obligatory. I was rather pleased with the grilles I made for my Neptune speakers (themselves inspired by the ones on my ProAcs), so I repeated more or less the same construction for the Classics. In this case the covers have standard black grille cloth stretched over black-painted 6mm plywood frames and fastened on the hidden inner sides with Bostik All Purpose Adhesive, all attached to the front of the speakers with the default plastic popper mountings. The stepped baffle of the Classics incurred a little complication compared to the flat (albeit two-piece) front aspect of the Neptunes: I added a 3.5mm plywood outer shell around each side of the frame, slanted to cover the bevels around the outer baffles, and an extra block of plywood to allow the fixing at the top of the baffle to be attached. I have to say I noticed a funny thing once I had finished my speakers and taken some photos of them in the living room. Troels's own build of the SEAS Clasics has the port in the same side of the baffle as the tweeter and mid, while the plans I followed have it on the opposite side. My first thought was "oh, no, I've got it wrong" - but Troels's 3-Way Classic with Scan-Speak Discovery drivers and his Audio Technology 3-Way Classic both have the same alignment as mine. I'm sure it makes no differece whatever to the sound. 300B push-pull differential monobloc power amps that I built to a design by Kevin Kennedy, and also a pair of Croft Series 5 stereo EL84 push-pull amps for comparison. The CD player and tuner are middle-market antiques, but have served me extremely well for years. On the other hand, I regard the vinyl disc playing front end as close to the state of the art in neutrality, naturalness and detail: the Vector mods removed some pitch instability from the original PT TOO and firmed and deepened the bass. I am also very pleased with the SVP preamp, which I feel has the ability to present the "whole picture" of what is going on in the music, without pushing it at you in a fatiguing way. It still has some slight hum, particularly on the phono input, which I hope to sort out, once the speakers have settled in, by replacing the HT regulators. The 300B monoblocks just do their job beautifully. My Neptune speakers are quite similar to the Troels's Classics in that they also use an 8" bass and 4" midrange driver in a cabinet with comparable width, so I had a feeling that the Classics would drive the room in a similar way, apart from the underdamped box resonance in my design. I expected the Classic Mk II to have a better balanced response, better phase behaviour through the crossover regions, punchier and less boomy bass, and higher sensitivity. To start with, I was surprised by how similar the character of the 3WCs was to the Neptunes. First to go on were a couple of old favourite LPs that I know to be well recorded: Pink Floyd's The Division Bell, and Debussy's Danses Sacres et Danses Profanesi, with Bernard Haitink and the Concertgebouiw. When I first fired up my ProAc Studio Ones, all those years ago, I remember being quite disappointed, as their sound was quite muddy compared to what I had heard from the demonstration pair in the shop, but their sound developed quite nicely over the following month or so. My first impression from the Classics was similar, and even after I reduced the series resistor in the tweeter leg of the crossover from 2R7 to 2R2 I found them a little uninspiring. After a week or so, though they started to open out; the bass became less thick and heavy, and the high frequencies started to clarify. They are still a long way from being lean or clinically revealing, but that is fine with me! I think the placement of the speakers only a few centimetres from the wall means that their bass is always going to be slightly plummy, and their soundstaging potential won't be reached in their current location, but their balance is very satisfactory all the same. The most obvious improvement over my previous is the quality of the bass. Orchestral cellos and basses, as well as bass guitars, have a much more palpable presence, where they sounded quite weak before and the melodic line they carried often got lost. As an example of this, I hadn't realised until now that Joni Mitchell's Hejira had so many different bass players on it - Jaco Pastorius's singing electric fretless bass obviously dominates the album, but I hadn't noticed the upright bass on Blue Motel Room before, nor that Jaco's fretless is replaced by Chuck Domanico's fretted bass elsewhere. Similarly, drums sound pleasantly visceral, even though the absolute low frequency extension of cone area are almost unchanged. Just out of curiosity, I carried out a quick and subjective check to see whether the 300B amplifier is a little rolled off at high frequencies. To check out the latter possibility, I quickly swapped out my 300B amplifiers and VSE preamps for my spare Marantz PM43SE integrated amp, and played a handful of tracks through each arrangement from CD. These were Leonard Cohen's So Long, Marianne"; Bach's B Minor Mass, directed by John Eliot Gardiner; and Lydia Mordkovich playing Shostakovich's First Violin Concerto. The overall tonal balance, to my relief and also surprise, was very similar between the solid state and valve amplification, as was the impression of musical detail. In most other respects, though, I was glad to find that the valve pre-power system proved much superior: the sound was fuller and richer, the soundstage was deeper and wider, and the 3-Way Classics revealed was a slight harshness from the transistor amp that we found tiring after a few minutes. In retrospect I made a lot of extra work for myself with my 3-Way Classic project . The layered panels, the slatted hardwood outer casing with its rounded edges, the inset bi-wire connectors, my insistence of using T-nuts to attach the drivers, and the leather finish for the baffle, all contributed to a task that was a lot more complex than the model construction on Troels's site. I made these choices partly because of my limited toolset (though I think I would seriously consider saving up for a router before any future speaker building project! ), but I certainly don't regret going the extra mile with the cherry and leather final touches. For obvious reasons, I am very grateful to Troels Gravesen for his excellent website and for his generous and useful advice on the project. I have also gained enormous amounts of information and inspiration from reading the Multi-Way Speaker DIY Forum. Finally I have to thank Brenda for her patience and tolerance of my lengthy absences in the garage, as well has her forebearance in complaining about the noise of my power tools. Troels' advice for choosing one of his projects. Some "construction tips" from Troels. Troels has written a fascinating article on the subjective effect of crossover order. He describes fourth-order crossovers (such as the ones in my Neptunes) as having a "dry monitor-type of sound", but not sounding "lifelike", and he generally prefers second order filters. A Finnish builder's comments on his build of the 3WC MkII. In short: he really likes them! A long-lived and interesting thread on DIYAudio, this one on time alignment in three-way designs, specifically mentioning Troels' Classics with the stepped baffle. Jantzen Audio's crossover kit for the 3-Way Classic Mk II. A DIYAudio discussion on Troels's "house sound". this degenerates for a while into a slanging match around the qualities of NAD amplification, but in the end gets back on track. Another DIYAudio thread on three-way designs in general. One contributor describes Troels's ScanSpeak 3-Way Classic as "near perfection". A YouTube slide-show of a builder's beautiful build of the Three-Way Classic, with solid oak sidecheeks and leather finish. 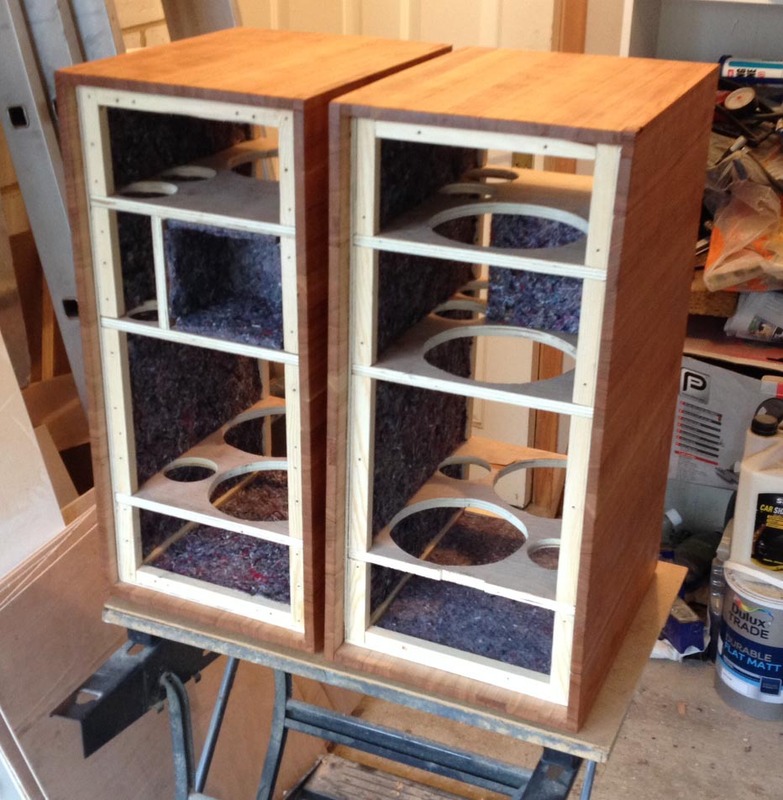 A builder's account of his 3-Way Classic project on AudioKarma. A discussion on the Parts Express forum on the three-ways. An interesting application of speaker simulation applied to, among others, the SEAS Three-Way Classic. Although this technique has limitations (particularly in the omission of any effects from the baffle), the predicted response of the 3WC is very smooth and flat, a tribute to the quality of Troels' choice of drivers. A German company who appear to be offering pre-built cabinets for the Three-Way Classics. A review on the Speaker Asylum of Troels's "Poor Man's Strad", which uses similar drivers to the 3-Way Classic, but in a very different enclosure. A general discussion (all positive) on Pink Fish Media of Troels' speaker projects. An interesting thread on a forum I am unfamiliar with: one member says that a local audio dealer was so impressed with his build of Troels's Ellam XT project that they used them in the shop as their demonstration speakers! Jantzen Audio in Denmark supply crossovers, drivers and other various bits: I ordered the crossover kit from them. Not the fastest to respond to e-mail, but otherwise very good service and prompt despatch, once my order was in the system. Falcon Acoustics, who managed to get the SEAS drivers, along with other items including spikes, grill cloth and fixings, to me the very day after I made my online order. No complaints! I sourced the leather for the baffle from IWantFabric.com, an e-bay supplier of reclaimed leather, along with a wide selection of other furnishing fabrics. Good service. The cherry wood for the stands and the outer shell of the boxes came from Bamptons Timber in Southampton. I got the damping sheet from a local specialist dealer, Southside Car Audio. I found the T-nuts in Portswood Hardware in Southampton: I am always amazed by the breadth of stock in this traditional family shop, and the staff are always willing to hunt an item out.